it's a little precarious to host a gathering on the stairs. but if they're long enough, you could fit quite a few. tough for the wait staff, though. I think "Upstairs" is the name of their building courtesan, a la Moulin Rouge! Though I think they should give her a sexier name. 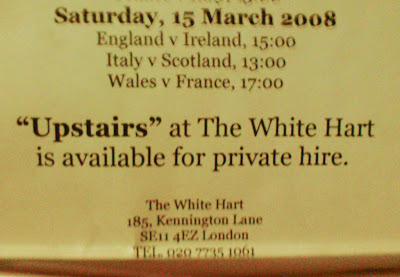 andi, does that mean that mean that if she's down in The White Hart "entertaining" the guests she would be "Upstairs downstairs in her nightgown"? Okay, that was bad. Really bad. I admit it. wow. i'm certainly going to think twice before i ever say "i'm going to head upstairs" again.